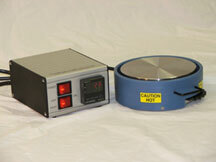 Our Wire Bonding Heat Chuck - Hot Plate Rotates a full 360 degrees for ease ofoperator movement for Wire Bonding. This low profile 2 inches high fits easilyunder the wire bonding arms, Rotation can be easily adjusted by finger adjustmenton the unit or manually move the unit. the bottom plate is nickel plated to allow foreasy slide. Temperature Range of Ambient +5 Degrees to 200 Degrees C. OptionalVacuum with multiple configuration of vacuum rings available. Top Plate StainlessSteel Six inches in diameter. Digital PID Temperature Control with Alarm Band-Cutout.